Materials and Techniques: watercolor on paper. This painting called "The Lady Khorshid" is painted by Abolhassan Ghafari. The subject looks intently at the viewer, her gaze establishing a direct connection between her, the represented participant, and the viewer, an interactive participant. This visual configuration is a demand, as she explicitly acknowledges the viewer: the character wishes to influence the viewer in some way to enter into an imaginary intellectual relation with the her. 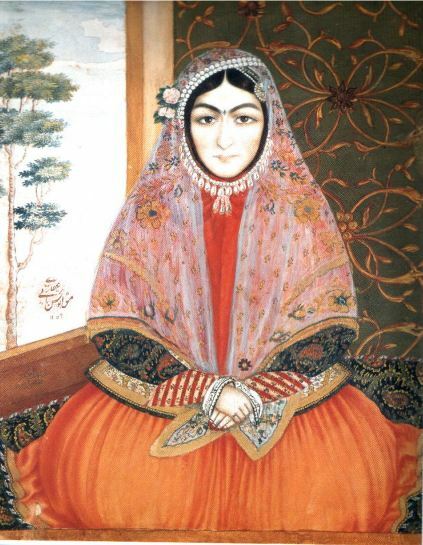 Lady Khorshid was actually the painter's cousin, who possibly acted as the matriarch to Ghaffari clan. In this image, the woman’s body language, stance and gaze suggest a challenge to the target audience to comprehend her. The symbolic design pattern on a darkly painted interior wall is in contrast with the clear sunny day outside. Here a connection is established between the Lady Khorshid and the viewer, also because of the horizontal angle from the front, that is because she is facing the viewer squarely. Such a representation invites the involvement of the reader with the image.